There’s no need for us to tell you the value in staying hydrated, no matter what your day has in store. But for advice on which reusable water bottle to choose? That’s something we can help with. Below you’ll find our top water bottle picks for 2017. They include a range of styles, from classic hard-sided plastic or stainless steel bottles that work well for everyday use to premium insulated bottles that are equally great for hot and cold beverages. Weight-conscious hikers, backpackers, runners, and climbers may want to consider a lightweight, soft-sided collapsible bottle instead. To help guide you to the best option, check out our comparison table and buying advice found below the picks. Capacities: 18, 32, 40 fl. oz. What we like: Excellent insulating performance and premium build. What we don’t: Expensive and doesn’t fit in most cup holders. The Hyrdro Flask Wide Mouth is the Cadillac of water bottles. Its most impressive feature—and the reason it costs a pricey $40—is the insulated double-wall build that keeps your water cold and coffee hot. In fact, the bottle is rated to keep drinks hot for 6 hours and cold for a whopping 24 hours, and we’ve literally had ice cubes live a full day in our Hydro Flask without melting. Throw in superior build quality, a stainless steel interior that’s easy to clean, an impressive range of color options, and a slightly textured feel that’s easy to grip yet tough, and you have one heckuva water bottle that should last for years to come. Keep in mind that the 32-ounce, Wide Mouth version of this water bottle does not fit in most standard cup holders (the Standard Mouth, 24-ounce version below does). And the 14-ounce weight isn’t ultralight by any means—for hiking and other backcountry use the Nalgene Wide Mouth and other minimalist plastic bottles below are quite a bit lighter but non-insulated. But we love the Hydro Flask for work, use around town, and throwing in a pack for a short hike or snowshoe. People rave about Hydro Flask bottles and for good reason. What we like: Best seller for a reason: light, durable, and cheap. What we don’t: No insulation for hot/cold drinks. A classic in just about every sense of the word, the Nalgene 32-Ounce Wide Mouth is the epitome of a tough, hard-sided plastic bottle. In the same way you refer to Kleenex for facial tissues, it’s common to ask, “Did you grab your Nalgene?” no matter the brand of bottle you’re actually using. Colorful water bottles like the HydroFlask or Klean Kanteen are now the rage, but the original form of water bottle expression was covering your Nalgene in stickers. Other than a BPA-free update years ago, the Nalgene has soldiered on with few changes. There are a range of color options, and it remains a great choice for anything from hot cocoa to a backup freezer bag (it’s safe to freeze water in it). The only downside—other than if you prefer to avoid plastic—is it doesn’t insulate. 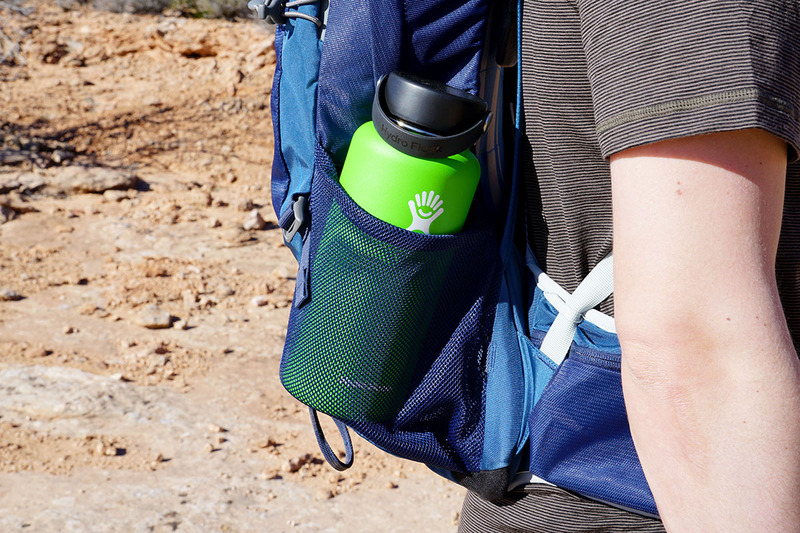 If you love the classic Nalgene look but want to trim some ounces for hiking or backpacking, Nalgene’s Ultralight 32-ounce Wide Mouth brings total weight down to 3.5 ounces. Capacities: 18, 27, 40, 64 fl. oz. What we like: Quality build and good looking. If you don’t like the idea of plastic, Klean Kanteen makes quality stainless steel water bottles that look great. This adds some dollars to the bottom line, but metal is easier to clean, retains less taste from previous beverages, and doesn’t have that plastic smell. And even though this bottle is not insulated, water seems to stay cooler a little longer than other see-through plastic options on this list. What are the downsides? Klean Kanteens are heavier than plastic bottles and can dent if you drop them (this can be an issue if you dent the bottom of the bottle and it no longer balances upright). But that's a relatively small complaint, and we like that the company has made a strong commitment to being environmentally friendly (Klean Kanteen bottles can be recycled). Thanks to the long-lasting build, it may be a while before you consider getting rid of it. Capacities: 18, 21, 24 fl. oz. What we like: Standard mouth version of our top-rated bottle above. What we don’t: Small maximum capacity; expensive. Hydro Flask’s Standard Mouth bottle shares many traits with the top-rated Wide Mouth above, but with a smaller opening makes it easier to drink on the go. The Standard Mouth has the same excellent double-wall insulating performance, high quality construction, and even includes a smaller version of the flex cap. The narrower opening makes it a bit more difficult to clean and is a tight squeeze for multiple ice cubes, but it’s still a top everyday choice. And unlike the Wide Mouth, all versions of the Standard Mouth bottle are designed to fit in a car’s cup holder. Where the Hydro Flask bottles differ most are accessories—the Standard Mouth can be purchased with a pop-up sport cap—and capacities. The Wide Mouth jumps from 18 to 32 ounces in size, but the Standard Mouth is offered in a 24-ounce model, which is great for daily use (unfortunately, that’s also the largest capacity offered). For many people including commuters the tipping point is the cup holder compatibility, but you really can’t go wrong with either. What we like: Very functional auto seal design. What we don’t: Clip-on handle is cheaply made. A bit of an unknown, Avex bottles have quietly gained a following, highlighted by consistently good (and sometimes surprised) reviews on sites like Amazon. Our favorite bottle in their lineup is the Brazos. The beauty of this bottle is its auto seal function. To use, just push the button along the back of the cap, which opens the spout. Releasing the button stops the flow. The system is easy, works seamlessly, and doesn’t spill. And the bottle is better built than many others in its price range, logging a whole lot of hours and abuse with nearly zero reports of durability issues. In our opinion, it’s the better bottle when compared with the über popular CamelBak Eddy below. The top is easier to clean than the Eddy’s straw and it isn’t as prone to leaking, while costing the same. That’s an easy decision for us! Capacities: 25, 32, 50 fl. oz. What we like: Easy to drink out of spout. What we don’t: Quite a few reports of leaking around the cap. CamelBak’s Eddy water bottle may be the one you see most around town, but we think their Chute is the better design. The main appeal of the Chute is easy drinkability—CamelBak made a narrow mouth cap with an angled opening that creates a predictable flow. And the cap can be removed for filling the bottle up with water or ice cubes. Priced at $14 for the 32-ounce size, the Chute is a good value at only $3 more than the simple, twist-top Nalgene above. What pushes the Chute down to 6th on our list is a spotty reliability record. 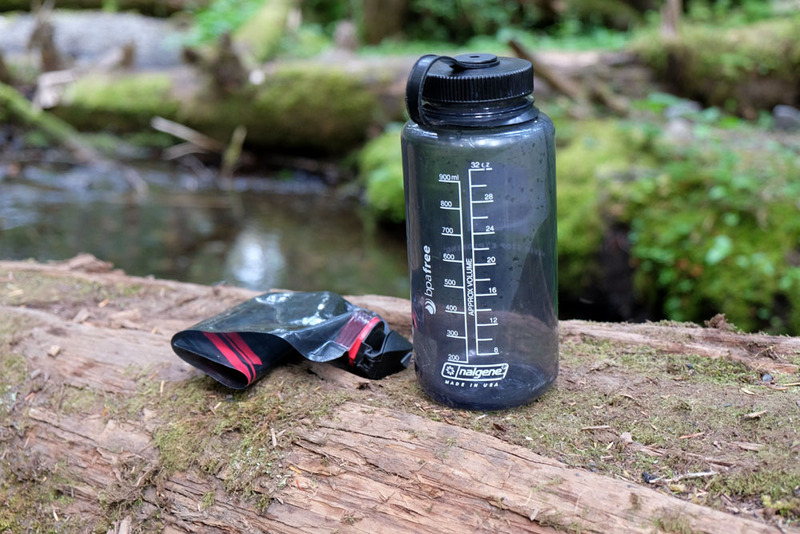 While many people have been very happy with the bottle, there are more instances of leaks occurring around the cap than you get with the proven Nalgene. If you can avoid the leaks, however, the Chute is a versatile water bottle that’s equally as good in the office as it is on the beach. Capacities: 20, 32, 64 fl. oz. What we like: Fantastic insulation; quality construction. What we don’t: No wide mouth 32 oz. option. Klean Kanteen can be credited with starting the stainless steel craze a decade ago, and it continues with its line of insulated bottles. As with the Hydro Flask above, the Klean Kanteen serves your all-day purposes: sufficient insulation for coffee in the morning and a stainless steel interior that lets you transition to water in the afternoon without retaining tastes. We do prefer the large flex cap that you get with the Hydro Flask, but the loop cap on the Klean Kanteen is still easy to carry. 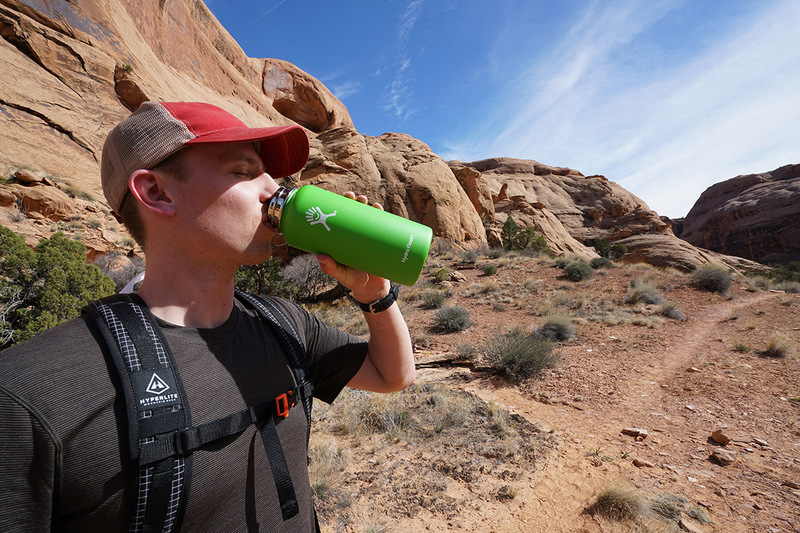 We’re a bit stumped with why Klean Kanteen doesn’t offer the wide mouth in a 1-liter model, which in our opinion is the optimal size for hiking and outdoor adventuring. If you like smaller capacity bottles, the insulated wide mouth model is available in 12, 16, and 20-ounce varieties. And the insulated classic with a smaller mouth is available in 20, 32, and 64-ounce versions. Capacities: 18, 25, 36 fl. oz. What we like: Classic looks, good value. What we don’t: Occasional quality control issues. Camping and outdoor enthusiasts will immediately recognize the distinctive look of the Stanley Classic Vacuum water bottle. Taking plenty of cues from their Classic Thermos but with a different lid for sipping water, the Stanley is a solid performer. The bottle is rated to keep beverages cold for 13 hours, and the handle that’s connected to the cap is easy to carry or attach to a bag. At $30 for the 36-ounce model, the Stanley also represents a good deal among double-wall vacuum designs. What are you giving up for the Stanley Classic Vacuum’s value price? The main compromise is in build quality—the Stanley is a slight downgrade from the Hydro Flask and Klean Kanteen models above. The plastic pieces are a little cheaper, and the rubber O-ring that seals the cap does have a tendency to fall out (replacing it is easy, however). But if you take good care of it, the Stanley is a great looking bottle with good all-around performance. Capacities: 25, 34 fl. oz. What we like: Super light and compact; surprisingly durable. What we don’t: Flexible shape often requires 2 hands for drinking and pouring. If weight and packability are important, it’s hard to beat Platypus’ DuoLock SoftBottle. This soft-sided 1-liter bottle tips the scales at an impressively low 1.6 ounces and can be rolled up to a size that fits easily in your hand. The “DuoLock” in the name refers to a new cap system that has both a narrow opening for drinking and a wider space for filling up. More, durability is quite good considering the thickness of the plastic. We haven’t managed to put a hole in any of our Platypus bottles over the years, something we cannot say about most of the soft-sided competition (including the Vapur Element below). What you give up in a superlight design like the DuoLock SoftBottle is a rigid structure. The soft plastic doesn’t hold its shape very well—and it gets worse when the bottle is only partly full—which can make pouring water or even drinking from the bottle a job that requires 2 hands. More, the bottle doesn’t fit as easily into a cup holder or water bottle pocket of a backpack. For hauling water, climbing, or as a backup on a trip, it’s hard to beat the weight, but the DuoLock is not a great option for everyday use. Capacities: 18, 26, 36, 64 fl. oz. What we like: Strong construction, great performance. What we don’t: The most expensive bottle on this list. Yeti is well known for its premium coolers, so the jump to insulated water bottles is natural. Our favorite bottle in their line-up is the 36-ounce Rambler, which has a stout build, strong loop cap for easy hauling, and, not surprisingly, fantastic insulating performance. The burly Rambler is rather heavy at 21.2 ounces and may be overkill for some, but is a great fit for rough use on a rafting trip or around a work site. From a build quality standpoint, the Yeti Rambler is hard to fault, but we struggle justifying the $50 price. The Hydro Flask Wide Mouth above is a near match in terms of performance and durability while saving you a fairly significant $10. If you want the best of the best, the Yeti surely has its appeal, but it’s just too expensive to earn a higher spot on our list. What we like: Light and compressible, but still has a good structure. What we don’t: Plasticky smell and taste. HydraPak’s Stash water bottle offers an innovative and compact design for outdoor adventurers. The bottle features a solid plastic top and base, but the middle is a flexible plastic that can be compressed when it’s not filled with water. The hard plastic gives it good structure that is easy to slide in and out of a backpack, and it packs down small while weighing only 3.3 ounces in the 1-liter size. This makes the Stash a great choice for hikers, runners, and lightweight backcountry explorers. What’s not to like about this water bottle? Our primary complaint with the HydraPak is the plasticky smell and taste that is difficult to get rid of. It was particularly noticeable after being exposed to the sun and heat while we were out on a backpacking trip in Utah. As a result, despite boasting a compact size, low weight, and good durability for a soft-sided bottle, the hint of plastic that won’t go away drops it toward the middle of our list. What we like: Small, light, and easy to drink from. What we don’t: Small maximum capacity; not our favorite cap design. Nalgene’s On the Fly (OTF) bottle gets a spot on our list with its lightweight and affordable design. Its large loop top and narrow opening for drinking make it simple to haul and drink while on the go. Unfortunately, the single, 24-ounce capacity does limit its appeal for backpacking, but this Nalgene is priced right at $13. The closest competitor to the Nalgene OTF bottle is the CamelBak Chute above. Both are fairly simple plastic designs that differentiate themselves with easy to carry and drink from caps. Between the two, we prefer the CamelBak’s cap, which is easier to open and close quickly. In particular, it’s important to check to make sure the metal bar is flipped up on the Nalgene to avoid surprise leaks. On the plus side, the Nalgene’s narrow shape fits well in cup holders and bike bottle cages, and at only 4.6 ounces, it’s a viable option for hikers and climbers that don’t need a large capacity. Capacities: 12, 16, 22 fl. oz. What we like: Clean, pure tasting water. What we don’t: Smaller capacity, heavy, glass is vulnerable to breaking. Plastic bottles are known to have a lingering smell that is tough to completely eradicate, and even stainless steel will leave a slightly metallic taste. So where do you turn for a scent-free, BPA-free, PVC-free, free-free bottle? Glass. There’s no better option for the discerning water drinker, and our favorite glass bottle is the Lifefactory 22-Ounce Flip Cap. Now, let’s state the obvious, even with a silicone cover, the Lifefactory is not all that durable. Drop the bottle from a good height, say, from chest level, and you’ll more than likely have some shattered glass to clean up. That said, these bottles are becoming more and more popular for the simple reason that the water tastes better. It’s no mistake we drink water from a glass at home, but does the risk of breaking make it worth it for daily use? That’s for you to decide. What we don’t: Bite valve and straw are tough to clean and can collect mold. For convenient drinking with a very small risk of spilling, it’s hard to beat a built-in straw. The Camelbak Eddy is our favorite of this design with a simple bite-and-drink system that just works. More, CamelBak makes this bottle in a ton of colors (at the time of publishing, we counted 9 on CamelBak’s site) that should make just about everyone happy. The straw adds a little weight, but at 6 ounces, it’s still great for both everyday and outdoor use. Our biggest complaint with the CamelBak Eddy is how hard it is to clean. The bite valve and straw are difficult to access and completely dry out, and as a result prone to collecting mold. If you’re diligent about maintenance and prefer a built-in straw, it’s a good system. But the mold issue is enough for us to push this extremely popular bottle toward the bottom of the pack. What we like: Opens from the bottom for easy cleaning. What we don’t: Single capacity; mostly intended for biking. As its name indicates, a simple and effective cleaning process is what differentiates Clean Bottle’s Water Bottle. The lower portion of the interior is an area prone to bacteria build up and can be a pain to reach in certain designs without a bottle brush. But Clean Bottle gives you quick access via a threaded cap on the bottom (the second opening also makes it dry very quickly). As maintenance goes, the Clean Bottle is about as easy as it gets. Unfortunately, the Clean Bottle doesn’t stand out in any other way. The flexible plastic is intended to fit inside a bike’s bottle cage but feels cheap for daily use. More, you can only get it in a 23-ounce capacity and not everyone likes the pop-up sport cap. A final issue is that the second lid on the bottom means there are 2 potential areas where the bottle can develop a leak over time. All that said, for cyclists looking for an affordable and easy to clean design, the Clean Bottle has its place. Capacities: 23, 34 fl. oz. What we don’t: Thin plastic is vulnerable to punctures. With a feathery weight and large capacity, the Vapur Element is a terrific bottle for hiking, backpacking, and climbing. The soft-sided construction weighs considerably less than hard-sided water bottles and folds up when empty for storage. In terms of features, you get an easy-to-use flip top cap and carabiner-style clip for attaching to a pack or harness. Its primary competition is the Platypus above, and while we prefer the flip top that comes with the Vapur, we’ve developed holes in nearly all our Vapur bottles (granted, the holes developed after scraping rocks) and are yet to puncture the better rated Platypus. If you take good care of it, the Vapur remains a great bottle, as hundreds of online reviewers can attest to. Its compact form and easy drinking cap are a winning combination. 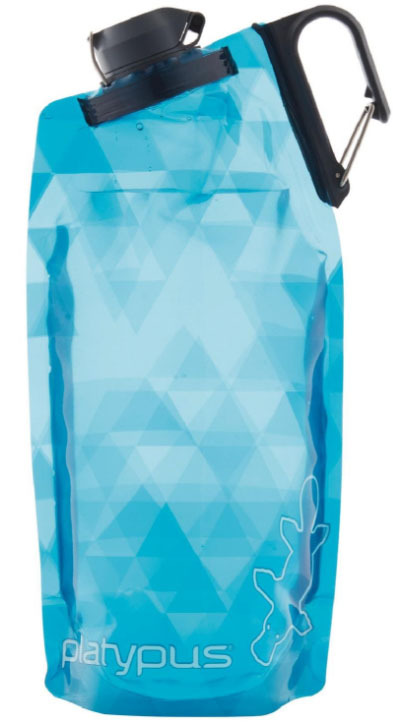 Hydro Flask Wide Mouth $40 Everyday/outdoor 14.1 oz. Stainless Steel Yes 18, 32, 40 fl. oz. 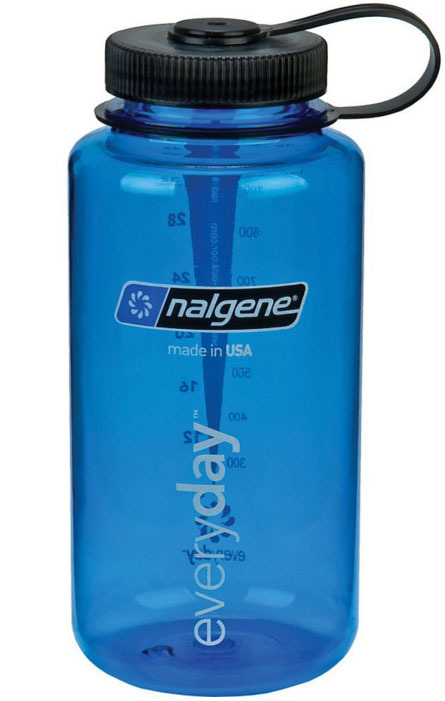 Nalgene Wide Mouth $11 Outdoor/everyday 6.3 oz. Plastic No 16, 32, 48 fl. oz. 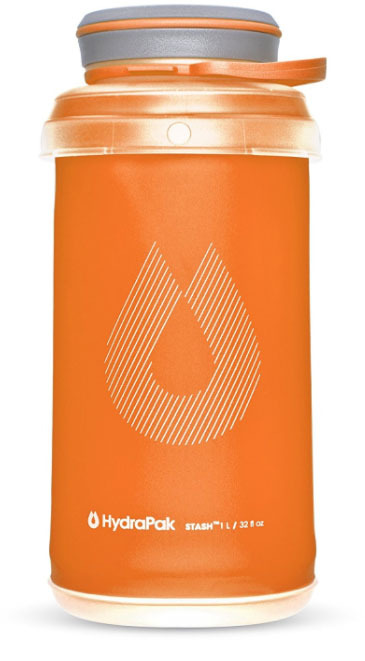 Klean Kanteen Classic $21 Everyday/outdoor 7.5 oz. Stainless steel No 18, 27, 40, 64 fl. oz. Hydro Flask Standard Mouth $35 Everyday/outdoor 12.8 oz. Stainless steel Yes 18, 21, 24 fl. oz. Avex Brazos Autoseal $15 Everyday/outdoor 6.2 oz. Plastic No 25, 32 fl. oz. CamelBak Chute $14 Everyday/outdoor 6.1 oz. Plastic No 25, 32, 50 fl. oz. Klean Kanteen Insulated Classic $37 Everyday/outdoor 14.9 oz. Stainless Steel Yes 20, 32, 64 fl. oz. Stanley Classic Vacuum $30 Everyday/outdoor 18.7 oz. Stainless Steel Yes 18, 25, 36 fl. oz. Platypus DuoLock SoftBottle $14 Ultralight 1.6 oz. Plastic No 25, 34 fl. oz. Yeti Rambler $50 Everyday/outdoor 21.2 oz. Stainless Steel Yes 18, 26, 36, 64 fl. oz. HydraPak Stash $23 Ultralight 3.3 oz. Plastic No 25, 32 fl. oz. Nalgene On The Fly $13 Everyday/outdoor 4.6 oz. Plastic No 24 fl. oz. Lifefactory Glass Flip Cap $25 Everyday 19 oz. Glass No 12, 16, 22 fl. oz. CamelBak Eddy $15 Everyday/outdoor 6.1 oz. Plastic No 25, 32 fl. oz. Clean Bottle Water Bottle $10 Ultralight 5 oz. Plastic No 23 fl. oz. Vapur Element $14 Ultralight 1.4 oz. Plastic No 23, 34 fl. oz. Hiking with Water: Water Bottle or Hydration Reservoir? The most common use for a water bottle is to stay hydrated in daily life: commuting, at work, and around town. In general, everyday bottles need to be durable enough to withstand the occasional drop, although there are a growing number of relatively delicate glass designs available (some have silicone cages to prevent breakage). Considerations like weight are less important here, and while it’s often nice to have a spout that’s easy to drink out of while on the go, both wide mouth and narrow mouth bottles are popular options. Nearly every water bottle that made our list excels in everyday life, and your own priorities will push you toward a specific material type and whether or not you need insulation. Bottles built for the outdoors have a tough construction to handle drops and rough use. Non-insulated models like the Nalgene Wide Mouth are a classic choice, and if you’ll be outside in extreme temperatures and don’t need to worry about carrying a little extra weight on your back, a burly insulated model can be a great option. 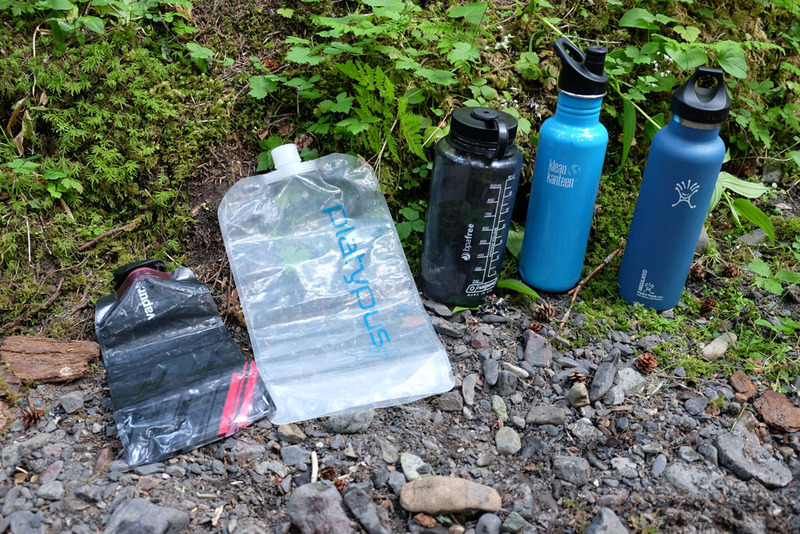 Hydro Flask and Yeti bottles are popular among campers, rafters, and motorized backcountry explorers for their sturdy builds and ability to keep beverages cold or hot for hours at a time. Ultralight bottles are best for activities where you’ll be carrying water for long distances, such as hiking, backpacking, and climbing. Bottles like the Platypus DuoLock SoftBottle, HydraPak Stash, and Vapur Element fall within this category, and trade durability for weight savings and a small packed size (most have a thin, soft-sided plastic construction). Because of their narrow focus, ultralight bottles are not a great option for daily use and excel only when weight is an absolute priority. The weight of a water bottle can vary widely—a look at our table above shows our picks range from just over 1 ounce to well over 1 pound. And depending on your intended use, this can either matter a lot or not at all. 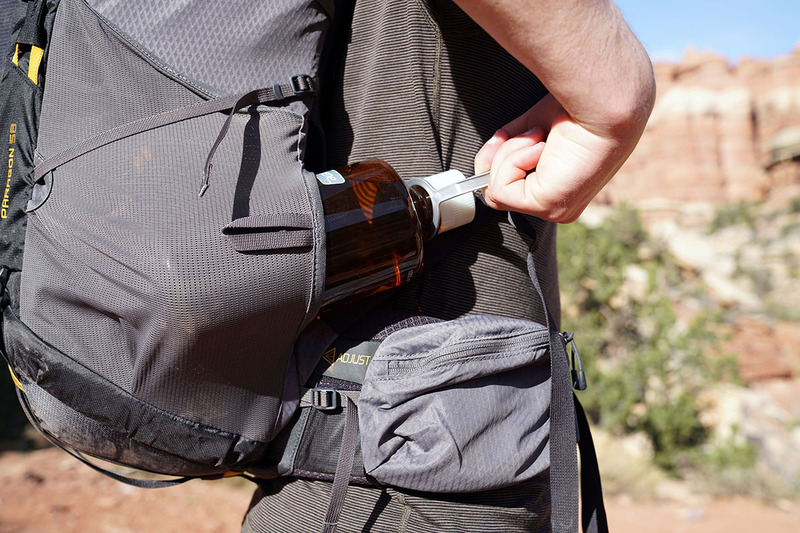 Travelers, backpackers, climbers, and others that need to carry a bottle for long stretches are most inclined to take weight into consideration. In those cases, it’s hard to beat Nalgene, which combines backcountry durability and ease of use at only 6.2 ounces in weight. And if you’re all-in on weight savings, the ultralight 1.6-ounce Platypus DuoLock SoftBottle is worth a look. But for daily use, or when the benefits of an insulated bottle take precedence, it’s perfectly reasonable to carry a 20-ounce (or more) bottle. For reference, 16 ounces of water adds about a pound of weight (1.04 pounds to be exact). Across the everyday, outdoor, and ultralight bottle designs, the most common type of water bottle is made with plastic. The BPA scare from old Nalgene bottles (they’re now all BPA free) has done little to dent enthusiasm for the material: it’s affordable, in most cases pretty durable (although less so than most stainless steel), and lightweight. Downsides of a plastic bottle are that they can develop a plasticky smell if you don’t consistently clean them or leave water inside for a long time, and they do not offer any insulation. For those that don’t like the occasional taste or smell of plastic in their water bottles, stainless steel bottles like the Hydro Flasks or Klean Kanteens above are extremely popular. While it’s true that these bottles can have a bit of a metallic taste, they are the more agreeable option of the 2 for most people. Stainless steel bottles are also known to be very tough, and are more likely to dent rather than crack or puncture like a plastic or glass bottle. More, they are fairly easy to clean and get rid of lingering tastes, even if you switch between coffee and water during the day. Finally, for those wanting an insulated bottle, a double-wall stainless steel design is the way to go. Glass bottles are an interesting option for daily use, particularly if you won’t be traveling very much with it (leaving it at a desk is one example). The biggest appeal is the lack of a plastic or metallic taste that you can get with the other 2 material types. On the other hand, the biggest downside—and reason why only one glass bottle made our list—is the lack of durability. Just like with your glasses at home, it’s easy to ruin a glass bottle by dropping it. Even the silicone sleeves that are wrapped around many glass bottles do not keep them from being the least durable option. Double-wall insulated bottles are a fantastic invention—they can keep beverages hot or cold for hours at a time, even in pretty extreme temperatures. For daily use, an insulated bottle like the Hydro Flask Wide Mouth is our preferred choice because it covers all our water and coffee drinking needs. But quality insulated designs are about 3 to 4 times more expensive than a comparable non-insulated bottle and add quite a bit of weight. As a result, even though we would love to carry a Hydro Flask while backpacking in the heat, it’s just not a practical solution. Our take is if you want to invest in a nice water bottle and don’t care too much about weight, you’ll most likely be very happy with an insulated bottle. Just about every water bottle we have included above is offered in a range of sizes, which we’ve listed in our specifications. On the small side are bottles around 16 to 18 ounces, which are good for those that value the compact size, but you’ll find yourself filling up your bottle quite a few more times throughout the day. Our preference is to size up to the 24 to 32 ounce range to minimize fill ups without being too bulky to carry around. Some models are offered in up to 64-ounce capacities, which are great for water storage (particularly the insulated models for places like remote construction sites), but those are too large for most people to haul around. A final consideration is for folks that put their water bottle in the side pocket of a backpacking pack or daypack. Often, a 32-ounce wide mouth design will be stretching the side holster to the max. A further consideration is whether you want a hard-sided or soft-sided bottle. In most cases, hard sided is the preferred option: it has a solid structure that fits easily into a cup holder or backpack side pocket, and is the easier option to drink out of with one hand. Hard-sided bottles come in a variety of styles, including insulated and non-insulated stainless steel, plastic, or glass, and all but the glass bottles are known for their durability. Soft-sided bottles, on the other hand, trade durability for compressibility and weight. Ultralight bottles like the Platypus DuoLock or Vapur Element pack down really small and weigh less than 2 ounces for storing water inside a bag or hauling on a multi-pitch climbing route. But they aren’t very convenient as daily pieces because the flexible shape has a tendency to bend when tilting to drink or pour water. Unless the weight and packability are important to you, we recommend going with a hard-sided bottle. As the term indicates, the mouth opening refers to the diameter of the bottle with the top removed. There aren’t standardized measurements for what qualifies as narrow, standard, or wide, but some general characteristics apply. Logically, a narrow bottle will be the most difficult to fill (and some may require you to shrink down ice cubes to fit inside). Standard openings, like the Hydro Flask Standard Mouth above, often are a little larger than a narrow mouth bottle, but still only just wide enough to fit one or two ice cubes vertically at a time. Wide mouth bottles are the most versatile and easiest to clean, but they’re also prone to spilling while taking a sip. An easy solution, however, is to get the wide mouth style with a smaller cap and spout. For most, a simple screw-on or pop-top lid is sufficient for drinking water. However, as seen with the hugely successful CamelBak Eddy, a user-friendly integrated straw has its appeals. The straw makes quick sipping a breeze while reducing the risk of accidental spills. That being said, straws do add some complexity and weight, which isn't great for hikers. Additionally, straw systems are another thing to clean, and many are not very easy or even capable of being taken apart. As seen with its 14th place finish, we aren't as smitten with the Eddy as more traditional bottles, but, realistically, the straw question is one of personal preference. If you're diligent about cleaning it and like the design, it could very well be your perfect water bottle. 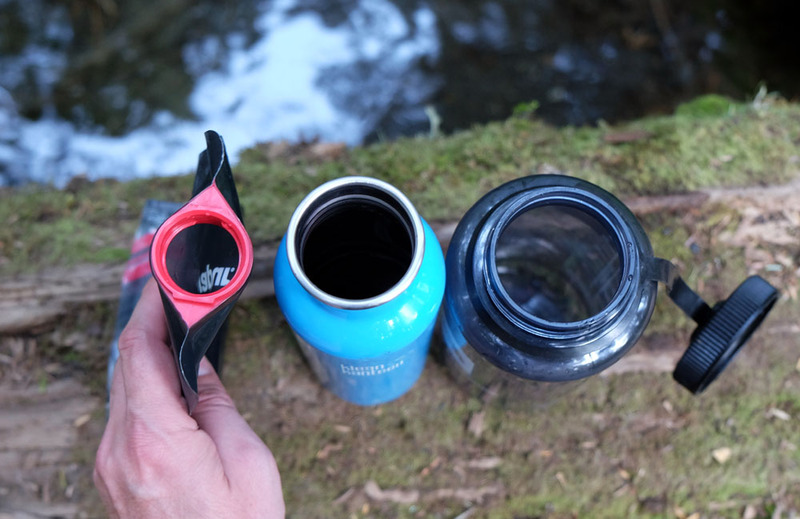 For hikers, runners, and travelers that desire an all-in-one water bottle and filter/purifier, there are a growing number of options that fit the bill. Bottles like the Grayl Ultralight Purifier and Katadyn BeFree work by integrating a filter or purifier into the bottle’s cap or straw. Generally, filter systems are best for clearing out murky water thanks to a hollow frame filter that protects against protozoan cysts and bacteria. They do have limitations, and most are not able to get rid of viruses, which is what purifiers are for. Because purifiers neutralize viruses, they are the go-to choice for international travelers. Is it worth getting an integrated system? For most hiking and backpacking trips, we prefer the traditional separate filter or purifier. You’ll get a higher output and capacity from those systems as well as more flexibility to fill up multiple bottles. For travel, however, a built-in system can make a lot of sense. Being able to quickly treat or filter your water just about anywhere is a beautiful thing while on the go. And always having the purifier with you means you don’t have to worry about tracking down bottled water in remote areas. 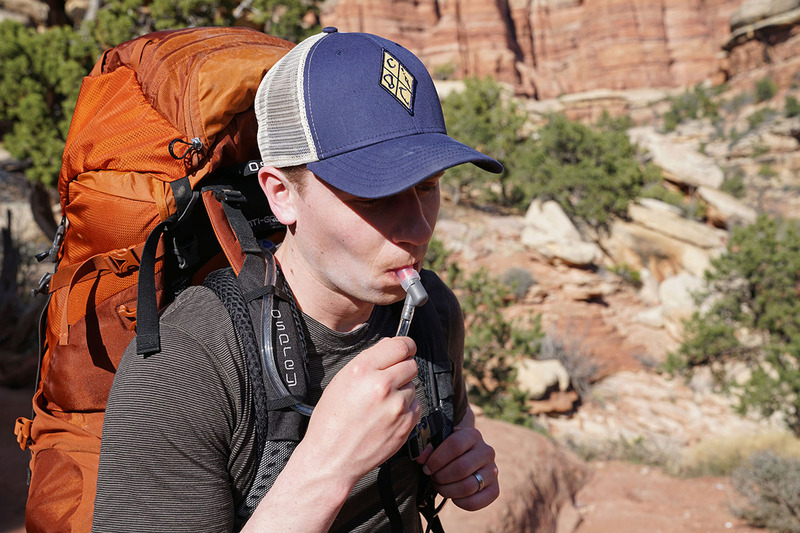 To see a full breakdown of options, see our article on the best backpacking water filters and purifiers. A common alternative for hiking and backpacking is a water reservoir. These consist of a main bladder or reservoir that holds the water and a drink tube with a bite valve at the end of it. With the tube placed along your backpack shoulder straps, you always have quick access to hydration. This means you’re more inclined to drink water—always a good thing on the trail. Weight and capacity are two additional reasons to go with a water reservoir. We’ve had great luck using both the CamelBak Crux and the Platypus Big Zip for anything from mountain biking to backpacking. Backpacks are built to accommodate either style, with side pockets for storing a bottle and sleeves built into the interior of the pack to slide in a reservoir. Reasons to choose a reservoir include their low profile design and hauling capabilities. Most hydration sleeves are in the center of the pack, which also helps with weight distribution—water bottles on either side pocket can shift weight as you drink from one or the other. They in no way are a perfect substitute for water bottles, however. The connection between the reservoir and tube is a source of occasional failure, which can cause leakage inside a pack. This is something we experienced on a trip in Utah, and we unfortunately didn’t identify the leak very quickly, resulting in some wet clothing and gear. Another downside for hydration systems is their storage sleeve is most often deep inside the main compartment of your pack. As opposed to a water bottle stored in a side pocket that can quickly be grabbed and filled up, removing the reservoir is time consuming and a little tedious. Conclusion: For backpacking or when you need maximum water storage, having a water bladder in your arsenal is a great idea. But never rely on them as your sole water carrier, particularly when heading out to more remote places. As with our concerns with soft-sided bottles, springing a leak far from a trailhead is a path to potential dehydration. We always recommend bringing along a water bottle or two as a backup. Remember the BPA-free craze a number of years ago? Bisphenol A (BPA) is a chemical used in hard plastics that until fairly recently was present in many water bottles. There is a fair amount of debate as to the effects of BPA on humans, and we aren't scientists here at Switchback Travel, but the good news is that the chemical has basically disappeared from the water bottle industry. You'll often see prominent stickers that say "BPA free" on the front and all bottles on this list meet that criteria. Because BPA is used in plastics, it's not found in aluminum or steel water bottles. No matter what type of water bottle you choose, regular cleaning will ensure better tasting beverages, a longer lifespan, and improved safety for yourself. In most cases, the best way to clean a bottle is with hot, soapy water. And a number of plastic bottles, such as CamelBak’s Chute and Eddy are designed to go on the top rack of a dishwasher. Either way, verifying you’ve cleaned out the bottom—something that’s easy to do with the screw-off bottom of the Clean Bottle—as well as the crevasses and threads in the lid are important. More, letting each part completely dry will reduce the chances of any mold or bacteria build up. If more intense cleaning is required, mixing a teaspoon of bleach with water is the recommended method from most manufacturers.